On Saturday the 5th September 2009, Gani Fawehinmi the legendary Nigerian human rights lawyer and activist died following a two year struggle with lung cancer. 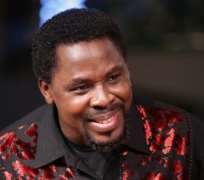 As news of his passing swept throughout Nigeria and beyond, local television outlets broadcast various pictures of Fawehinmi dressed in his official gown and cap, evidently the clothing TB Joshua alluded to in his vision. Thousands trooped to his official residence to pay their last respects to the late legal luminary, writing condolences in a journal underneath a large framed portrait of the lawyer clad in gown and cap, the attire he donned to fearlessly and tirelessly pursue the cause of justice, liberty and equality for all. Described as 'The People's President' and 'The Conscience of Nigeria', Gani spent his life campaigning for the restoration of rights for the Nigerian public, daring to defy anyone who stood in his path. Gani was a constant thorn in the flesh for corrupt government officials, arrested and imprisoned on numerous occasions for his uncompromising, tenacious and outspoken stance against crooked practices within government circles. His supporters called him "the scourge of irresponsible governments, a sphygmomanometer with which the blood pressure of dictators is gauged, the veritable conscience of the nation and the champion of the interests and causes of the masses", Gani is clearly a man whose life and legacy are worthy of the heroic status referred to in the prophet's utterances. With his seemingly boundless energy, Gani boldly pursued and crusaded his beliefs, principles and ideals for the untrammelled rule of law and undiluted democracy, spearheading the call for protection of fundamental human rights and respect for the hopes and aspirations of the masses, often victims of the mismanagement of the Nigerian government. Gani did not deem neutrality as even optional. "I am not a middle-of-the road man,” he said. “What I believe in, I pursue intensely.” He wholeheartedly believed that if you have not found a cause worthy of dying for, you have not really lived. Prophet TB Joshua's prophetic ministry continues to draw a growing number of viewers to Emmanuel TV, baffled by the uncanny consistency of his words and works. In a generation without faith and hope, people are desperately seeking evidence of Christ's reality and power, tired of mere words within religious circles. The ministry of TB Joshua certainly provides such.